Thelma Martin was the most important teacher in my life. She was the first person who ever made me feel special about my perceptiveness - that I really had some talent. I used to stay after school and talk to her for which some used to give me a hard time for "brown nosing." It was inconceivable that anyone would like to talk to Miss Martin, but I loved to talk to her. I could talk to her about things absolutely no one else wanted to talk about - like why people acted as they did - what it all meant. I read constantly, and Miss Martin was the first person to acknowledge that it was important to appreciate literature and to encourage me. She was the person who turned me on to Hesse and Sidhartha - way before college. I was so afraid that I was going to turn into a spinster school teacher because we shared this bond. I corresponded with her after I left MHS. I learned the hard way how much those single women teachers actually cared for us. I had mentioned that I was coming back for the tenth reunion, and she asked me to stop by to see her if I had time. I didn't take her request seriously, and I didn't visit her. I learned later from Jeanette Davis how disappointed she was. I had no idea. We were their lives - the evidence of their life's work! 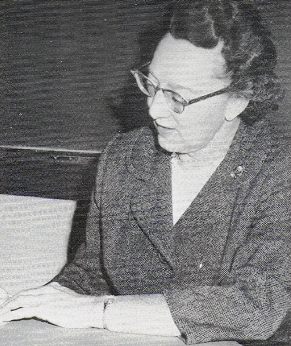 Miss Martin had been in the service during the Second World War. She then had a position with the Girl Scouts of America - a national position for which she traveled a great deal. I can see her in my head. Her curly brown hair pulled from her face, but not in a bun like Miss Hess, and that bright red lipstick. When she was forming her thoughts to speak, she would purse her mouth into a narrow "O." She was the first person I ever knew who wore designer suits. She never wore a traditional business suit. She wore suits in pastel colors with piping and trim that imitated Chanel - and silk blouses. Can you see that perfect script - even on the black board? All the letters matched each other in size and never on a slant. She was inimitable. I was scared to death of her and absolutely fascinated at the same time.